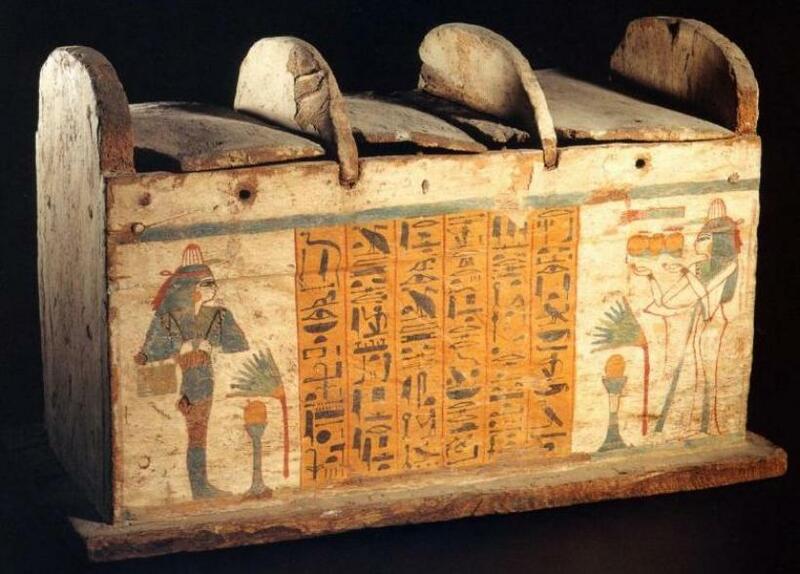 Coffin Texts are written containing spells painted or engraved on the sarcophagus and coffins of Ancient Egypt. They are partially derived from the earlier Pyramid Texts, reserved for royal use only, but contain substantial new material related to everyday desires, indicating a new target audience of common people. Ordinary Egyptians who could afford a coffin had access to these funerary spells and the pharaoh no longer had exclusive rights to an afterlife. The above is a Shabti-Box of the lady Mutemmertes who is facing her own shabti, carrying hoes and a basket. Shabti spell is written in between. The wooden coffin is 34.5 cm height, 56 cm length, 32 cm width. They are developed during the Middle Kingdom, when it is believed that the nobility got the right to use the magical-religious texts, which were previously only reserved for pharaohs . Its origin comes, in part, of the Pyramid Texts (c. 2350 BC.) of the Old Kingdom, when immortality and resurrection was limited only to royalty, but include many new contents and beliefs of the Empire means. The people could only access sacred formulas from the New Kingdom (c. 1500 BC.) and this resulted in texts called Book of the Dead . One ancient leather manuscript has rituals spells and colorful depictions of divine and supernatural beings, predating those found in the Book of the Dead manuscripts. This leather roll is around 2.5 meters long, with text and drawings on both sides. 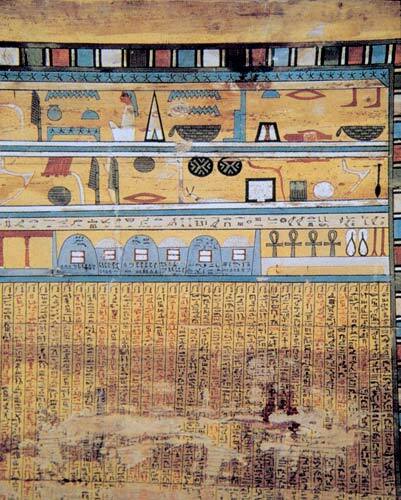 It is both the longest surviving leather ancient Egyptian manuscript and the oldest. A certain holy place that is protected by multiple gates and their powerful guardians. These latter are characterised as supernatural beings with immense magical powers. The texts in the scroll contain this specific and magical knowledge that is required to pass safely by these dangerous beings and get access to the divine restricted area behind the gates. I shall sail rightly in my bark, I am lord of eternity in the crossing of the sky. I am not afraid in my limbs, for Hu and Hike overthrow for me that evil being. I am equipped and effective in opening his portal! As for any person who knows this spell, he will be like Re in the eastern sky, like Osiris in the netherworld. He will go down to the circle of fire, without the flame touching him ever!